I have been wanting to make one of these for a couple of years, but have been lazy about it, didn't think I could do it...bla...bla...bla....LOL...SOOOO....I got out all the jewellery I wanted to use, went to Michaels and scored a shadow box at 60% off, went to Wal-mart and happened upon the perfect fabric in the "ends" bin, got some pretty stick pins and off I went to create. I made a "tree". I still plan on writing where each piece of jewellery came from and taping it to the back, but I do like how it turned out! I have pins from my mom, my two aunts, my grandmother, my husband's grandmother a tie clip of my dad's and some jewellery I had as a child! What do you think of this creation...I am curious! November 1.....life......should I be thinking so much? Good morning everyone...and Happy November 1st! It's been a busy and typical week here in my household. I got a bit of stitching done...I did not finish Creepy Crawly and will keep it in my sewing basket..(still love the design, but black on black is very hard on these eyes! !.....I'm getting there though, skeleton is done! ).....I have to move on to making a couple of little things for Christmas. I've been in one of those moods were I contemplate life. I hate feeling like this! Short history...I do not work outside the home. I have not (except for a 3 year stint as lunch monitor at the school) worked fulltime since 1999. I and many of my workmates were offered buyout packages at the company we worked for. I took it...I was the 3rd person to sign up for it...the second person was Sidney Crosby's mom for any of you Hockey fans.....anyway, I had 20 years with that company.....long drives and hours....little time seeing my children...etc....I was estatic at the prospect of being a stay at home mom...and I have never regretted that. 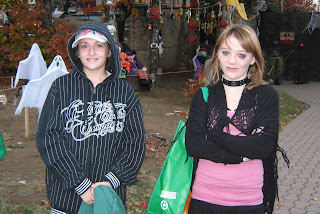 Fast forward to present.....my kids are almost 19, almost 16 and 12 1/2. They are not little anymore. The problem is....I still enjoy being a stay at home mom. There are still places to drive them, appts....friends over..etc...and we still live WAY out in the country and I do not handle the winter driving part well....so no, I don't want a fulltime job. I feel guilty....I feel like I should be doing more...or should I? I go through feelings like this periodically. Another problem is, I am not a young stay at home mom. I had all my kids in my 30's, so while I am not completely OLD at the ripe age of 51, my kids are still fairly young. I guess I can look at it this way...I had 20 years fulltime for the same company....BEFORE my kids were very old....oh I don't know...I am rambling....the thought of working part time in Wal-mart or somewhere makes me gag....maybe I just need to go for a long walk and clear my head! LOL.....if you are still reading this....god bless! My son (who I don't have photos of) went to a "Haunted Yard"....in the area...it was spectacular by the way. I just realized that my older vampire is on my other camera, so I'll have to dig that out and post later...sorry. Greetings fellow Bloggers! I hope everyone had a great week...and here it is the beginning of another week! I had a good week. I drove 60 miles (each way) to meet a good friend for lunch on Friday. I took my youngest with me, as she had an inservice day. My friend and I browsed some second hand shops, but I got nothing...nothing at all! It was great company for lunch though.....we have been friends for almost 30 years. We actually shared an apartment together about 26 years ago...and lived to tell about it...and remained friends! She was a bridesmaid at my wedding...and she is about the best friend a girl could have. Anyway, I have been busy working on blanket #15. This was origionally going to be a baby blanket, but somehow I ended up with an "almost" full size blanket. The lady I am making it for wanted it for her grandson, so I debated on what to do...I realized the error just after I started...she said she will be thrilled to get whatever I make...so I continue.....it will actually be great for a toddler...her grandson is about a year and a half at the moment, so it should be good for his bed?! The lady picked the colours...yellow background and brown and green yarn. It is actually quite pretty, although not colours I would pick for myself. The design is "Creepy Crawly" by Blue Ribbon Designs. Sorry for the awful photo of the design! So, I finished blanket number 14! This is a "new to me" pattern, and will go my daughter's friend that had a baby girl a couple of months ago. At my daughter's request, I made a full size blanket, rather than the baby size...as we think the mom will enjoy cuddling with her daughter in this! I have already started number 15! It is a baby size blanket for our mechanic's sister's grandson. This will be the first one that I have actually charged anyone for. I am only asking for reimbursement for the yarn and fabric, and she was extremely happy with that. I hate quoting a price, but I do need to start getting reimbursed for at least the cost of everything. On the cross-stitch side, I have purchased a floor model Ott-Lite...and I am really liking it! I can see again! LOL I have been stitching a bit, but no real progress to show. Anyway fello bloggers, you have yourself a great day!! My DH gave me a camera for our anniversary. I have a really, really great camera, and one of my hobbies is picture taking, however this camera is too big to carry around, so he bought me one I can take in my purse at all times...if I want! The other night I was organizing my purse and decided that I needed some protection for my little camera, so I got out some yarn that I had and came up with this little drawstring camera case! It fits perfectly into my purse and my camera won't get scratched! Today I am off to get youngest from a Birthday party sleepover in a bit, and then I think we will browse a couple of second hand stores...it's a rainy and windy day, so great time to do it! WHAT IS SWEDISH WEAVING, AND HOW DO YOU DO IT? Well....I'll explain as best I can....you go to your local fabric store (in some cases Wal-mart) and ask them for Monk's Cloth. (For us stitchers...this is a 7 count fabric).....and you get two yards/metres (depending on what country you live in and whether or not they use the metric system)...then you take it home....stitch (by machine) on either end...leaving about an inch or two on each end...so that you can fringe it.....then you put it in the machine and wash it!! When it comes out you have a fringe on either end....throw it in the dryer...and pretty soon you are ready to begin! Next you find the middle of your fabric......and after you decided on the pattern you want....you start weaving your yarn through...row by row....I always use Red Heart yarn, varigated or plain, depending on the look I want.....and basically in a nutshell...that's it. Here are a couple of the many I have made....and when I am ready to start a new one, I'll go step by step with photos! I look at all the beautiful Blogs that I follow on a pretty much daily basis, the beautiful stitching, the great photos...and then there is my Blog....poor, poor Blog! I need to pay much more attention to MY Blog!! which I made at the request of MIL to give to her sister for Christmas. I started #14, which is well underway...it will be a surprise gift to my oldest daughter's friend. I ordered a bit of stash from Amy at Down Sunshine Lane...can't wait to get a start on those!! I finished up two little ornaments from the Just Cross-stitch Halloween Issues. My goal is to someday have my ornament tree up and running on a year round basis, with ornaments for each season/Holiday. DH and I celebrated our 22nd Wedding Anniversary on Saturday. We managed to get away, just the two of us, we had a late lunch, drove to look at some wonderful scenery, visited an antique store and also a winery...it was a fabulous day! This white vase I picked up at a local second hand shop for $2.00. My mom used to have one like it. Anyway, on Saturday while at the antique shop, I found the flower frog insert that fit it!! I was thrilled to say the least!! At the same second hand shop I picked up a couple of Vera Bradley's. This is one. This particular store imports all their merchandise from the US and a lot of it was display models...my Vera Bradley's are in new condition, just ones that may have been older store models or something. I have a few bags now...I really like switching them around. Anyway, fellow followers...I hope you are still around.....my goal is to be much more enthused with this blog and not everyone elses!!!! Take care...Have a fabulous fall day wherever you are! BACK TO ROUTINES......and new beginnings.. I'm still here...busy, but still here. I have been busy working on Halloween ornaments, which I hope to hang on my ornament tree at some point (now that I found it) and I have been finishing up a swedish weaving blanket, and getting ready for a new start with a new pattern....pictures will follow at some point on that. My three children have all gone back to school. Youngest in a new school....Middle School.....my son in grade 10, and my oldest in University! (She's liking it, by the way). I have been taking the dog for a walk every single morning since school got in two weeks ago! Just a short walk, but still counts, right? Anyway, I just wanted everyone to know that I'm still here. Two Days Until School starts! We've been busy...doing little day trips, shopping for back to school, the kids have been having friends over and sleep overs.....it's been nice. I've been busy stitching and working on my swedish weaving. I did finish up this cross-stitch and framed it. 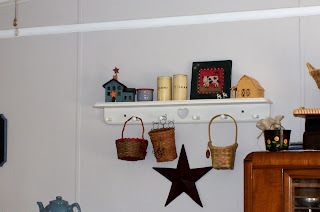 This is a frame I bought new, but I have been on the search for neat second hand frames and do have some on hand for future projects. This now hangs in my dining room. I just loved working on this one! It's "Sheltering Tree" from With Thy Needle and Thread. 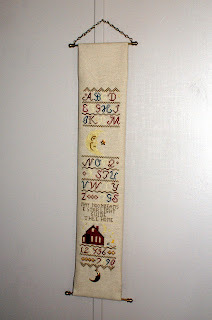 Wonderful, fun stitch. Yesterday we took a drive to Peggy's Cove Lighthouse, and to the Swiss Air Memorial Site....for those of you that aren't familiar with the Swiss Air Memorial Site....a plane crashed off the waters of Peggy's Cove in September 1998, killing all aboard. This site is a dedication to them, and a place for family members to go and pray, or just sit quietly. There was a couple there when we arrived...the man was hugging the woman, and they were reading the dedication. I was wondering if they had lost a family member in the disaster. Well, much to do today...I think I'll try and squeeze in a trip to the Thrift Store as well...if I have the time! 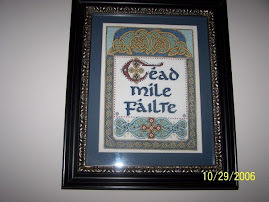 I have started a new Blog, as there are some Cross-stitch charts that I am done with and willing to sell or trade....I only have a couple on there right now...will add more as I get to them...please have a look if you are interested. Thanks! 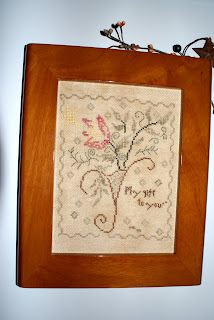 This is Blackbird Designs, "My Gift to You"...stitched and hung on my "Antique" wall going down to the family room. It was a fun stitch, and I like the frame I found for it. The above is a memory box I did in honour of my mom. I found some neat things when I had to go through her possessions....My mom was born in 1920, so alot of these things are super, super old. 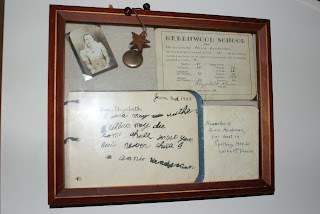 I have a school photo....a report card from when she was in grade 4, a "BirthdayBook" presented to her when she was 14, and most precious of all, an Autograph Book that belonged to her older sister, and mom wrote in it, and signed it when she was 7!! Also, all her sisters and brothers and mom signed it!! I just love that!! 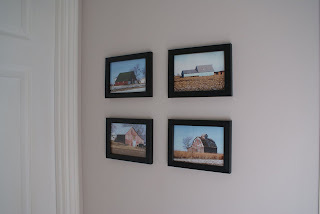 The above are beautiful barn photos taken by a friend of mine...he was nice enough to send me them and I printed them off and framed them for my kitchen! !